International Journal of Research in Health Sciences,2014,2,3,827-830. 1,2-Associate Professor, Department of ENT and Head Neck Surgery, MOSC Medical College, Kolenchery, Kerala, INDIA. The aim of this study was to investigate the efficacy and outcome of IV steroids followed by oral steroids in patients with sudden sensorineural hearing loss (SSHL). The study also evaluated the various comorbidities influencing the outcome of treatment with steroids. 30 patients who presented to the ENT department with sudden sensory neural hearing loss during the 15 month period from January 2013 to March 2014 were included in the study. Of the 30 patients, 20 were males and 10 females and they were in the age range of 20 to 60 years. Treatment was in the form of intravenous (IV) Hydrocortisone 100mg as a stat dose followed by IV Dexamethasone 8mg 8th hourly and then tapered over 5 days. This is followed by oral Prednisolone for 2 weeks. 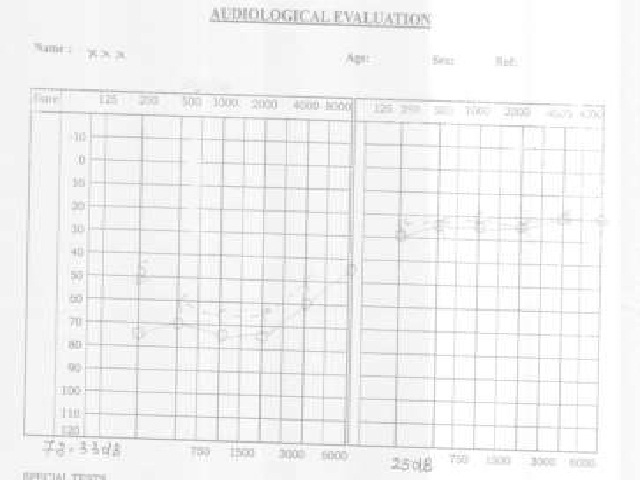 A pretreatment and follow up pure tone audiometry (PTA) was done and compared. According to our study, emergency administration of IV steroids to patients with sudden sensorineural hearing loss is highly recommended. The critical time for commencing treatment is within 6 hours from the onset of symptoms.